The journal accepts also advertisements and announcements of conferences as well as publications on related topics. 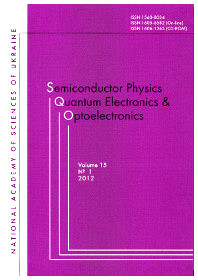 Semiconductor Physics, Quantum Electronics and Optoelectronics is published quarterly. Subscription requests should be sent to the Editorial Office. Manuscripts should be submitted in English and supplemented with a text file and figures. An electronic copy may be submitted by e-mail. 1. An electronic copy should be submitted by email. 2. Acceptable text formats: plain text (.txt), rich text format (.rtf), tagged text (ASCII), MultiEdit (.txt), WordPerfect, MS Word (.rtf, .doc), PageMaker (.rtf, .pm). 3. Acceptable graphic formats for figures: EPS, TIFF, BMP, PCX, CDR, WMF, MS Word and MS Graf, MicroCalc Origin (opj), JPG. Figures created using software for mathematical and statistical calculations should be converted to one of these formats. Official letter signed by a chief manager of the institution where the work was performed. This rule does not apply to papers submitted by international groups of authors. Publication permission: conclusion of a commission authorized to permit open publication of the paper (only for authors from Ukraine and other FSU countries). Agreement on copyright transfer to the Publisher. Copyright transfer forms may be obtained from the Editorial Office. These are accessible on the Internet page above. 1. PACS and Universal Decimal Classification code (for authors from FSU). Several comma-separated codes are allowed. If no classification codes are indicated, the code(s) will be assigned bythe Editorial Board. 2. Title of the paper and name(s) of the author(s). 3. Name of affiliated institution, full address, telephone and fax numbers, e-mail addresses (if available) for each author. Abstract: up to 200 words, must be presented in English, Ukrainian and Russian. Before the abstract text one should indicate in the same language: the paper title, surnames and initials of all authors. Keywords: their amount must not exceed eight word units. In the specific cases it is acceptible to use two- or threeword terms. These words must be placed under the abstract and written in the same language. Text should be printed double-spaced on white paper (A4 format) with a 12-point font. Titles of the paper and sections should be typed with bold capitals. Equations should be entered using MS Equation Editor. Papers with handwritten equations are not accepted. Notations should be defined when first appearing in the text. Tables should be submitted on separate pages in the format of appropriate text processors (see above), or in the text format (with columns separated by periods, commas, semicolons, or tabulation characters). Use of pseudographic characters is not allowed. List of references should be double-spaced, with references numbered in order of their appearance in the text. The format for references is as follows: Books: Author(s) (initials, then last names), book title (in italics), publishers, city and year of publishing. (If reference is made to a particular chapter, indicate chapter title, book title in italics, and page numbers). Example: J. A. Hall, Imaging tubes, Chap. 14 in The Infrared Handbook, Eds. W. W. Wolfe, G. J. Zissis, pp. 132–176, ERIM, Ann Arbor, MI (1978). Journals: Author(s) (initials, then last names), paper title, journal name in italics (use abbreviated names only for well-known journals), volume and issue numbers, page numbers, year of publishing. Example: N. Blutzer and A. S. Jensen, Current readout of infrared detectors. Opt. Eng. 26 (3), pp. 241–248 (1987). Captions for figures and tables should be printed in the manuscript double-spaced after the list of references. Footnotes should be avoided if possible. Pictures will be scanned for digital reproduction. Only highquality pictures can be accepted. Inscriptions and symbols should be printed inside. Negatives, slides, and transparencies are not accepted. Figures: each figure should be printed on a separate page of the manuscript and have a size not exceeding 160×200 mm. For text in figures, use 10-point fonts. Measurement units should be indicated after a comma (not in parentheses). All figures are to be numbered in order of their appearance in the text, with sections denoted as (a), (b), etc. Placing figure numbers and captions inside figures is not allowed. On the back side, write with a pencil the paper title, author(s) name(s) and figure number, and mark the top side with an arrow. Photographs should be submited as original prints. At the moment publication of original papers, reviews or short notes in Semiconductor Physics, Quantum Electronics and Optoelectronics is free. There are no any submission charges. And there are no any processing charges for standard publication due to Waiver Policy for Developing Nations currently applied to authors from any country. Color printing is possible if its cost is covered by the authors or their sponsors. For information about the rules and costs, contact the Executive Secretary.